Here Hazrat Sultan Bahu Rahmatu-Allahe Ta-aala Alaihe says that: the season of spring has set in my heart and the narcissus of my heart has opened its eye on the soft bed of honor and pride. I have found the sacred Ka'ba of Ishq and Muhabbat where the Seekers of Lord, in their devotion for the Harem of the Beloved, day and night do Tawaaf and die on the Candle of His Beauty like moths. All curtains and veils have lifted between us and our Real beloved by virtue of offering this Noori Hazoori Hajj and that Sweetheart of Azal has favored us with His Didaar and we have become Haji Bey-Hijaab. 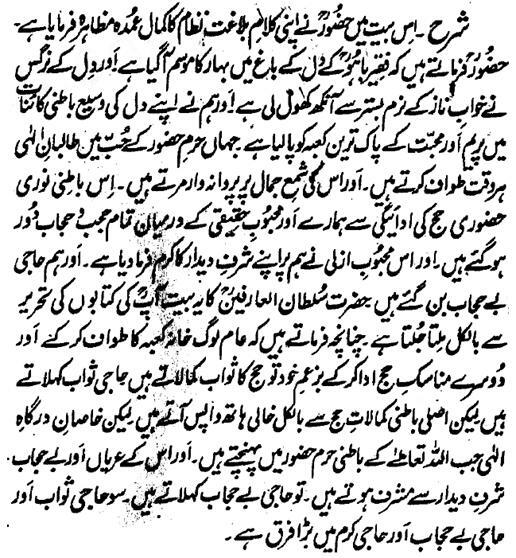 Hazrat Sultan Bahu Rahmatu-Allahe Ta-aala Alaihe has given some kinds of Haji in his books where he says that common people do Tawaaf of Ka'ba and after offering other formalities, earn Sawaab and are called Haji Sawaab. However, when the Special Devotees of the Sanctuary reach the Inwardly Harem of Allah Almighty, are honored with the unveiled and unrestricted Didaar of Lord and are called Haji Bey-Hijaab. Hence, there is great difference between Haji Sawaab and Haji Bey-Hijaab and Haji Karam.